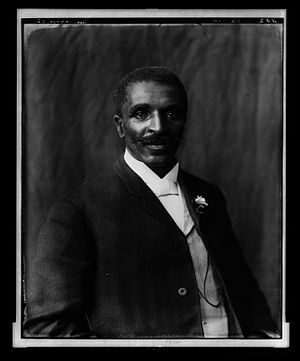 George Washington Carver (1864-1943) was one of the 20th century’s greatest scientists. He rose from slavery to become one of the world’s most respected and honored men. He devoted his life to understanding nature and applied his knowledge to the area of agriculture. He is best known for developing crop-rotation methods for conserving nutrients in soil and discovering hundreds of new uses for crops. Carver’s scientific discoveries included more than three hundred different products derived from the peanut, some one hundred from sweet potatoes, and seventy-five different uses for the pecan. His accomplishments did much to challenge the then widespread belief that the black man was of inferior intelligence. How far you go in life depends on your being tender with the young, compassionate with the aged, sympathetic with the striving, and tolerant of the weak and of the strong. Because someday in your life you will have been all of these. We have become ninety-nine percent money mad. The method of living at home modestly and within our income, laying a little by systematically for the proverbial rainy day which is due to come, can almost be listed among the lost arts. · Be clean both inside and out. · Neither look up to the rich nor down on the poor. · Lose, if need be, without squealing. · Always be considerate of women, children, and older people. · Be too brave to lie. · Be too generous to cheat. · Take your share of the world and let others take theirs. James 2:1-4 — My brothers, as believers in our glorious Lord Jesus Christ, don’t show favoritism. Suppose a man comes into your meeting wearing a gold ring and fine clothes, and a poor man in shabby clothes also comes in. If you show special attention to the man wearing fine clothes and say, “Here’s a good seat for you,” but say to the poor man, “You stand there” or “Sit on the floor by my feet,” have you not discriminated among yourselves and become judges with evil thoughts? James 2:8-9 — If you really keep the royal law found in Scripture, “Love your neighbor as yourself,” you are doing right. But if you show favoritism, you sin and are convicted by the law as lawbreakers.